Give your lawn a breath of fresh air and help it thrive with a lawn aerator. Over time, the soil beneath your lawn becomes compacted. When your lawn is compacted, less air and water can get to root system and soil. This can result in an unhealthy lawn. Lawn aerators are designed to core holes into lawns, loosening the soil and allowing water to feed directly to the root matter. Got a larger lawn area to aerate? Want to make sure you do the job properly? Or do you simply want to make the job easier? Choose a self-propelled lawn aerator. A self-propelled lawn aerator will help you reach maximum productivity, with less effort. 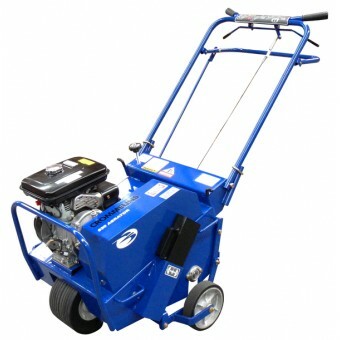 Our range of lawn aerators from Bluebird are designed for durability and ease of use, powered by world-class engines. Plus, you get all the convenience of special features for easy transportation and storage. For groundskeepers, gardeners and councils, a lawn aerator is an essential addition to your tool kit.